Magic of Christmas festivities kicked off Dec. 1 with the annual tree-lighting ceremony and parade through downtown Sedro-Woolley. The popular event drew the usual crowds, who braved fitful weather and cheered on the parade participants. Prior to the parade, children’s activities included free pony and train rides. More events are scheduled through December. Hosted by Beta Sigma Phi, Santa’s Breakfast is scheduled for Sat., Dec. 8, from 9 to 11 a.m. at the Sedro-Woolley Community Center, 703 Pacific St. Kids can enjoy a free breakfast of waffles, sausage links, orange slices, and milk or apple juice. Parents—how about a donation? Kids will meet Santa and get their photo snapped with him. The annual tour of historic homes is back for its 20th year. Hosted by the Sedro-Woolley Museum, the tour begins with an open house at the museum at 4 p.m. The homes open for visitors from 5 to 9 p.m.
Tour coordinator Stacy Penno—whose own home is on the list—said this year’s theme is the “12 Days of Christmas”—a nod to the first tour 20 years ago, which shared the same theme. “I was trying to recreate the first tour,” said Penno. The tour is self-guided; participants are encouraged to dress for the weather and bring flashlights. Tickets are $5; proceeds benefit the museum. Tickets may be purchased in advance at the museum or Oliver-Hammer Clothing, or at the museum the day of the tour. For more information, call 360.855.0203. On Sat., Dec. 15, adults and children are invited to have breakfast with Santa’s wife in the Coho Cafe at United General Hospital. The menu includes French toast, eggs, fruit, bacon, and sausage. Table activities will include crafts and letters to Santa. Mrs. Claus will take pictures with each child, which they can take home. Two seatings are scheduled for the breakfast, at 8:30 and 10:30 a.m. Admission is $10 per adult and $5 per child 12 and under. By mailing a check payable to United General Auxiliary, with a note about number of adult and child tickets, to United General Hospital, Communications Dept., 2000 Hospital Dr., Sedro-Woolley, WA 98284. Mail check no later than Dec. 3. By calling 360.856.7245 to pay with a credit card or make a reservation to be held at Will Call. 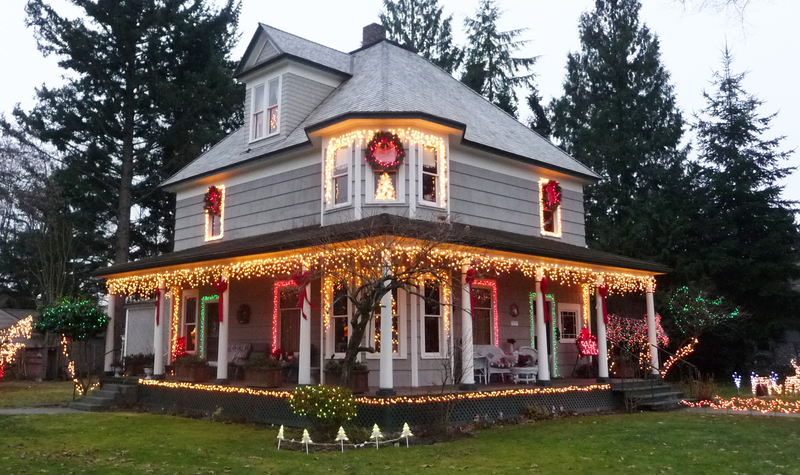 The Cecil and Stacy Penno home at 335 Warner St. in Sedro-Woolley is just one stop along a tour of 12 homes that comprise the Holiday Home Tour, one of many events that fill the Magic of Christmas dance ticket this year. Stacy Penno is coordinating this year’s tour, which is celebrating its 20th year with a nod to its first theme: “The 12 Days of Christmas.” Penno said the same theme will run through this year’s tour. Photo by Stacy Penno.